How should I erase my hard drive before I give it away? - Ask Leo! I would like to clear off/erase all of the programs on my hard drive and clean it up before I donate my computer to a worthy cause. What’s the best/simplest way to do this? To begin with, good on you not only for your donation, but for thinking to do this. All too frequently we hear of computers being donated by banks, hospitals, or other institutions and then turning up with all sorts of private information that should have been erased first. The best way? Well … how paranoid are you? Quite often, I get this question with an additional caveat – how to remove all of your personal information while leaving Windows installed. The problem is that even after removing all of your data – even if you remember to remove every scrap and even after removing every single application – some of your personal information will still be left on the machine. Well … how paranoid are you? If nothing else, there’s likely to be random information left in the Windows registry, and unless you take additional steps, all of those files that you carefully deleted could potentially be recovered. What’s worse, of course, are the people that do nothing and leave everything on the machine. It’s not uncommon to hear stories of second-hand machines containing a wealth of personal and private information from the previous user. What do I mean by properly? Windows (all versions), and even MS-DOS before it, have the option to perform what’s called a “quick format.” In reality, a quick format does very little except create an empty root directory on the hard disk and possibly add a label. The rest of the disk is actually assumed to be properly formatted already and left alone. That’s why it’s quick. And that’s why it’s also insecure. Because the rest of the disk is left untouched, any data that is already there will remain. Many commonly available disk recovery tools will be able to recover data from a “quick” formatted disk. So the basic and common answer is to reformat the disk, making sure to specify unconditional format. Unfortunately, if that’s your C: drive, you won’t be able to format the drive if you’ve booted from it and are running Windows from it. You’ll need to either install the disk in a different machine to be able to reformat it or boot from something else. DBAN (which stands for “Darik’s Boot And Nuke”) is a free utility designed to do exactly what we’re talking about by living up to its name: it’s a CD that you boot from that then “nukes” the information on the drive. DBAN will automatically and completely delete the contents of any hard disk that it detects. DBAN does this not by simply deleting files, but by performing a careful overwrite of the entire hard disk surface. When it’s done, everything is erased. In fact, DBAN has options to overwrite/erase the hard disk multiple times, so as to prevent any possibility of future data recovery. DBAN is now my recommendation when you’re about to dispose of a hard disk or give a computer away. It’s a common recommendation to use a big heavy magnet to really erase a hard disk. My advice is to forget it. Any magnets that you’re likely to have around the house, even your big speaker magnets, are unlikely to affect your hard disk in any significant way. I believe that there have been studies that show that even some exceptionally large magnets still leave the contents of hard disks in a recoverable state. Another approach to really, positively, and permanently destroy your data is to physically destroy the disk. Personally, DBAN is more than enough for me, but if I care enough to go this far, I use a drill press and drill a few holes all the way through the hard drive casing, through the disk platters, and out the other side. Unfortunately, that level of destruction also makes your gift significantly less useful. As I said before, it’s common to want to leave Windows installed as part of your gift. That may or may not be legal (it depends on the terms of the license for your particular copy of Windows). To keep it at least ethical, it means you would no longer keep or use that copy of Windows yourself. The right and safe way to transfer Windows in this case is to, after running DBAN, reinstall Windows from scratch using your original installation media. If your system didn’t come with installation media, then you could try the restore media that you received or you could restore to an image backup that you took immediately after receiving the machine. And part of your gift would be to include the product key that activated that copy of Windows. A product key that, as I said, you would no longer use yourself, having given it away. « Previous post: How Do I Get a Notification When Anyone I Send an Email to Forwards that Email? Yes, there are various utilities out there that will do varying degrees of data “wiping” to help decrease the chances that the data can be recovered. And if an unconditional Format isn’t enough for you, then they might be worth checking out. But remember that there are few guarantees … they only decrease the probability of recovery, not neccessarily eliminate it. Format takes care of the 99% case … the rest of you need to decide how much trouble you want to take. If you want to erase your hard disk, simply throw it into an incinerator. That way, theres no freakin way thanyone will ever get to your stuff. I’ve used the Web-deployable EraseYourHardDrive.com and found it to be an efficient and effective method of conducting a three-time disk overwrite and verification pass. The software automatically produces a Certificate of Data Erasure – guaranteeing success of hard drive erasure. I tried three off-the-shelf data recovery programs and could find no trace of data. I liked the fact that the software was Web-deployable so that I could erase the drive immediately and did not have to download an .exe file nor did I have to wait for a CD to arrive in the mail. Quick, convenient and obviously effective. That’s what formating does … it erases your disk. You can try googling for “unformat”, and you may find some tools that can help, but I would not be hopefull. at the risk of looking like i didn’t read the above comments (I did)…I gave away the desktop monitor years ago and kept my compaq hard drive out of fear of data security…it was purchased in ’99 and has a very old Windows on it…there’s no chance of buying or using any of the cleaning software – so are you saying the rumor of strong magnets won’t work? I live in an apt, I’mnot about to be drilling into anything…HELP! Anyone know of companies that come take away and clean hard drives?? ?someone once said tat HP had a day when people could drop off old machines but I’ve never seen it advertized. What can a paranoid do with an old drive lying around the apt that htey are dying to ditch??? Yeah, a strong magnet won’t. It’s pretty amazing, really – I’ve seen some interesting examples on TV of things that you would expect to be demagnetized by a high powered magnet that just keep on working. It depends on how paranoid you are about the old data. Putting the drive into a machine and simply performing an unconditional format would be enough for most. Otherwise, anything that you can do to destroy the disk physically (open the case, bend the platters, whatever) would be the near-ultimate. I want to agree with leo it is all about how paranoid you are. If you know that you have something on there you shouldn’t. Or are worried about someone finding it out. Then my advice is just get a 5 puond sledge hammer from home depot and beat the living crap out of it on the side walk. However if you just want to donate a computer. Get partition magic 8 and delete the partitions and recreate them, then use a 98 boot disc to format the drive and format it 5 times in a row. If anyone can recover your data after that, they worked hard enough for it I say let them have it. In all seriousness most people don’t know how to access the data on their computer that wasn’t erased. So don’t freak out I am the lead PC Tech for a Circuit City located in Countryside,IL. You would be amazed at how little the average person knows. Data Retrieval is not even in there vocabulary. So format it or smash it if you are that worried, Otherwise you could leave everything on there and for the most part no one would find anything anyways. Both ‘DriveScrubber’ and ‘KillDisk’ have functional demos for download- the file you download creates a bootable floppy disk that will overwrite the entire surface of whatever drive you choose-erasing data, partitions, etc. You would then have to create and format a new partition. It would take special hardware to retrieve any data after that. Takes about 2-1/2 minutes per GB on an average HD/machine. IBM has a free (Anyone can download and use it) software program that you can download from their website called “IBM(R) Secure Data Disposal (SDD) Version 1.2.”. It runs from a boot disk/CD, and a will wipe out your drive by copying, sectory by sector, track by track, random data onto the hard drive. It will overwrite everything that is there, as many times as you want. So there would be no chance of someone every reading what was on your disk drive. Caveat – doesn’t work with RAID systems very well, since it needs drivers to read them. I would recommend using a Overwriting software. That’s what Leo should have mention is Erase a hard drive using a Boot-Up Hard Drive Erasing Software (like Active Killdisk, etc etc. ), erase it Guttmann method, then erase it with other methods, then when your done you erase with One Pass Zeros so it looks like you never erased, or written data. Then after that Reformat, then install the Operating System (95,98,XP,2000,2003,Vista) not to mention you overwite when you reinstall your Operating System too. Now you know how to erase everything without destroying the hard drive. I need to have a data erasing service. Maybe computer repair shops can have a erasing service and make some $$$. Another way to destroy data from recovery is to put all data in a (Strong 128-Bit) or more encrypted container and reformat-it because you can recover files but never destroyed strong encrypted files from a deleted encrypted container. That’s the reason why Strong Cryptology is Banned in certain countries. Don’t use magnets, don’t destroy you Hard drive. It’s not nessisary. I inadvertently formatted my hard drive with the system rescue disk. THE GEEK SQUAD assures me they can have all my photos and videos rescued by a level three retrieval. A level 2 is $500, but a level three in a clean room is $1500. I this even possible, or am I getting ripped off? My request to format the hard drive is met with “Format cannot run because the volume is in use by another porcess” I have nothing else open or running. Any idea why I am getting this response? You have Windows running – windows has the volume in use. What about tools designed to permanently erase files from hard drive? There’s no mention of them here. I believe those are roughly equivalent to the multiple-format option mentioned in the article. for wiping your hard drive data… you can Stellar Wipe – An advanced safe data eraser. Here’s some advice on using geek squad if you’re computer literate enough to be posting and reading comments on this web site. Don’t. And as for their use of “clean rooms”, most of their techs don’t even bother with discharging electricity. I read your comment about a large magnet not being effective at erasing a hard drive. I have one of those “lift an outboard motor” magnets. I was hoping it would erase a notebook drive I have to return to H.P. because it failed. Because it had failed I was unable to use a program to erase it. I obviously can’t damage it because they want it back (or I pay for a new one – even though the in-warranty replacement they sent was apparently used (scratched). I have a lot of pesonnal info on it so I’ll try the magnet anyway – and hope for the best. what is about the DD command, so far as i know this is safe as well, isn’t it ? With regards to using magnets to erase your files. Even if you have a powerful degausser, if you want to give the drive away or have it usable afterwards, don’t use a magnet. The manufacturer stores important data on the disk for the drive itself to function. Erasing that will render the drive unusable. Also, it takes a strong magnetic field inside the drive to actually erase the data on the disk. Even magnets that you or I consider very strong typically don’t project the magnetic field strongly enough far away from it’s surface. And by far away, I mean about half an inch. Empty your trash bin and the space will then show up on your pie chart. When you delete something, it doesn’t free up your space until you empty the recycle bin. Emptying the trash only removes the addresses of the files in the trash. The files remain on the hard drive just as they were. This is why recovery programs can recover ‘deleted’ files. Also, bits and pieces of files may be left behind in the sectors used by new files. Emptying the trash is a superficial method of making files disappear from the folders and their space available for storing new data. True deletion of the data is the purpose of this web page and making deleted data unrecoverable by anyone. In MS DOS mode i typed in FORMAT/U and it says “required prameter missing-” what now? Gina, the parameter missing is the drive letter. Here is what I do, to delete my Ex: nakedPic.jpg: Before deleting it, I look for an innocent picture like: tree.jpg and I rename it nakedPic.jpg.The system tell me that that name already exist and if I want to replace it. I click yes. Now, if I open nakedPic.jpg, I will see a tree instead of my wife’s naked body. Now I delete it. If somebody recover this picture, all they see is a tree. No trace of other picture. You can replace an important doc,txt,jpg,mp3,… for a insignificant doc,txt,jpg,mp3,… save it and delete it after. I think that you should reconsider your technique. All you do is change the pointer of the file name, you do not overwrite any existing data. Eventually new data might overwrite some or all of that file. After deleting that newly named file, it and the first file still are on your hard drive since the OS does not overwrite data when it deletes the address in the directory, it only deletes the directory entry. Both files can be recovered unless their data has been overwritten. someone dedicated enough to the task it might be. I tried to run format c:/u and it’s asking me for the volume label for drive c but I do not know what that is. How do I find it? where XXXXXX is replaced by the volume label for that drive. Drilling right through the disk will completely kill the entire drive correct? shows – but remotely possible. There’s a space between format and /c. very nice article about how to erase your hard drive permanently. formatting can erase disk but not permanently as you said data recovery software recover these files. SO in this situation you could try drive wipe software which rewrite and overwrite the data by special algorithm so that it couldn’t be recovered by any recovery software. Look for DBAN… by far the best nuke program I’ve ever seen. I don’t know anyone that’s been able to recover data off a DBAN’d drive. And trust me, I know “social engineering” people who do it all the time on weak reformats. can I ask a question. I had a new hard drive with new bios put in. If I erase the HD will the BIOS be left so I can reinstall the OS. Erasing your hard disk does NOT erase your BIOS. What about encrypting the data? then I would think it could (in many cases) become an impossible task to decrypt the data, from the partly recovered data you get from the drive. As long a you’ve chosen a strong passphrase, and as long as you’re certain that the unencrypted data was never temporarily outside of your encrypted container (like, say, the Windows swap file or a temporary file) then yes, encryption could be a viable solution. Specifically I think if you used whole drive encryption from day one on the drive you might be ok.
>can I ask a question. I had a new hard drive with >new bios put in. If I erase the HD will the BIOS >be left so I can reinstall the OS. 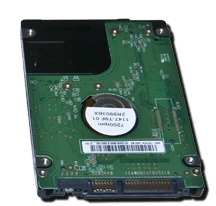 Why erasing hard drive is required ? Within a few moments, it’s melted and virtually destroyed. I can’t believe for a second that any data is still there. I also have a giant magnet that weighs about 20 pounds. I’ve often wondered what might happen if I put it in contact with the platter. Yep, like I said in this article, I’m partial to a drill press myself. (Though I recently posted a new article recommending DBAN – Darik’s Boot And Nuke, a tool for securely erasing hard drive contents without actually destroying the drive. You must tell it what drive to format: “Format D: /u” for example. Depends on what you consider “adequate”. I consider it enough, as long as it’s not a “quick” format. Hi! I have a failing external hard drive that I want to give to a local computer recycling center. I want to do this safely and I’m wondering if I can use a bulk eraser – the kind that radio stations used to use to erase reels of audio tape? Thanks. I wouldn’t. The hard disk media is more protected – by its case if nothing else – than bulk audio tape. Those magnets are still not strong enough to penetrate the case and layers of platters in the drive. I would not rely on degaussing. Do it, that’s fine, but it’s notoriously unreliable unless you’ve got a truly industrial strength degausser. Better to run software to clear the disk first. Try using WipeDrive – software which erases all data on your storage devices. My question: Assuming I can successfully scramble the drive, should that drive be able to be reformated by the new owner? Now that I have erased my HDD how do I get the new OS to install? When I insert the Windows or Linux install disc, it gives disc error and will not load. I have used a partition floppy to install a MBR partition but the OS will not start. Formatting Doesn’t Erase the Data,it can still be recovered.Use a Program called “Dban” which Overwrites the data with Random data several times…rendering it USELESS!!! It’s an Iso Image file,so you have to get a free program like “BurnAware” and burn the file to a Cd-r or Dvd-r.And boot it from System Start up. This goes to Jeff,the System might be too infected to just format,you might want to wipe the drive all together and then try to re-install Windows. If you want to be sure of total data loss, disassemble the hard drive, remove and destroy the discs. Formatting and deleting the data from the hard drive does not removes the data completely from the hard drive. It can be recovered easily using any recovery software, so removing the data in that manner will not be safe. So, to remove the data completely from the hard disk any special softwre is required and Wipe Mac is simply perfect which I used as well. It removes the data at changes the hard disk format in its native state that is to 0 and 1. I am sure it will help you out as well. i have a laptop that the screen is broken on. i want to erase the hard drive, but cant see anything to do it. i used to work at a drs office that has an MRI, if i have them put it in the room while its one will it do the trick? if so, how long should it be in there and how close? thanx! I think you risk damaging the MRI (there’s a reason they say NO METAL). I’d remove the drive and perhaps use another machine to wipe it. maybe you can see what’s running by connecting the vga port on side or rear of laptop to old display. Long-time fan, first time caller . .. Please support our goal of keeping laptops and smartphones out of landfills. Our goal is to be sure your personal information is completely erased in the process. Thanks for the great article and many years of excellent computer advice Leo, you are a legend! Yeah it is very imp to delete all the sensitive data b4 u get rid of ur hard drive.The simplest way to do this is by formattng the drive…but that too may not delete all the data and there are always chances to recover them.I can suggest you 1 tool that will remove all ur data permanently forever and no other tool can also be able to recover it.Advanced System Optimizer…there is this tool named Secure Delete in ASO that does the permanent deletion of the data…but be cautious once the data removed can not be recovered anyhow. I had reformatted a hard drive for someone and reinstalled windows xp. Then my friend tells me his wife wanted music and pictures on it. I could not retrieve them. So, after some researching I bought a program for $70.00 called Power Data Recovery that retrieved all formatted data to an external hard drive as long as the original data was not rewritten over. I was able to retrieve all her pictures and music. Then I burned them all to 2 DVD’s for her (or it would have been like 6 cdr’s). So,yes, it is possible with the right tools to retrieve data unless it is completely rewritten over with a data destroying program. i do’n undersand clearly that is WipeDrive is ? I removed the hard drive, the mother board is fried, what can be discovered on the RAM? We are selling it with full disclosure. We figure the buyers want the parts, screen, etc. We were suprised that anyone wants this stuff, but happy to keep it out of a landfill. Nothing. RAM is completely erased within seconds of removing the power to the machine. While I enjoy taking power tools to my redundant electronics (who doesn’t?! ), I can recommend this company’s Data Destruction services for anyone who needs it done in a more sustainable fashion. its is very easy to recover data even after it is format. most secure way is to download a software which provide complete delete. Formatting a drive will NOT I repeat will NOT destroy files on the drive even if it is an unconditional format. The proper way is to overwrite each and every sector on the drive with random data. Once is enough for all but perhaps an intelligence agency to recover BUT there is a defense department method that uses rewriting seven times with different data that will ensure even the NSA won’t be able to do it. I am NOT an expert it’s just a hobby to me. A fellow brought is hard drive to me and said I could have it if I did a complete format infront of him. I did the complete format then overwrote it with a large Linux OS then formatted it again then overwrote it with a different OS then formatted it again. Then I installed an OS system on it so I don’t think anybody is going anything off that thing. Besides nobody knows where the thing is. Not even me, It’s in somebody’s computer and I don’t keep track of that stuff. Poor mans method. lol. PS. Make sure you overwrite the WHOLE hard drive. Unfortunately that won’t overwrite the entire disk, and thus will leave things potentially recoverable from the free space that remains after the installation. I know that is overkill but if you are concerned with the data being recovered after holes are drilled in it, this should technically be more secure. i think you would have to run the encryption app from a liveboot OS (liveUsb, LiveCD, etc) or booting an OS from another drive. However, i suspect encrypting the whole target drive costs a larger processing expense than writing random data over the whole target drive. I also think that technically, encryption produces data that possesses a pattern (some meaning, in the philosophical sense). And even large ‘key’ and ‘password’ is finitely crackable. Writing random data produces data that is patternless (meaningless) in its essence. Comparing… random write-over seems cheaper and more effective. What about using fdisk? does win 95+ (98-win 8) still have it> Will that work (not as good as drill press) but still work than reformat? I used to use Fdisk then format then install whatever I could and do it again about 3 times then just fdisk and install the basic OS. If you don’t have original install media, see if you can make an install/recovery set of media _before_ you nuke the drive. In fact, even if you _do_ have media, see if there is a way to make an additional set. Also, if it’s not printed on the side of the computer (and sometimes Windows has been upgraded to a version other than the one on the sticker), you should use a utility such as Belarc Advisor — http://www.belarc.com/ — which can tell you the key for not only Windows itself, but most applications you have installed. Again, once you’ve nuked the drive, this information is gone. What ever happened to the bios format? I remember on older machines the Bios setup used to have a format. It doesn’t anymore it seems. I don’t recall BIOS’s ever having a format option. I have donated many PC’s/laptops over the years and my philosophy is this, simply remove your drive and install a NEW one! Hard drives are cheap. Maybe not so much for laptop drives depending on the size. But for piece of mind it’s well worth the added expense. I also would like to think that what I donate is not merely a worn out piece of junk but a machine that someone can rely on for a reasonable amount of time. One last point regarding computer donations and perhaps the most important. Know who you are donating to so you know your donation is not just being resold for profit. Especially in the case of laptops! We started a program at my church to recycle computers and I was stunned at the number of machines which started coming in. We started out with several of us getting together once a month to go through the machines. However there were so many we couldn’t keep up. So we recruited the youth groups to help. It gives these kids hands on hardware experience and they also teach us old farts a thing or two. It has been a very rewarding experience and everybody wins! On a paranoia scale of 1 to 5, you’re a 5 if you overwrite the entire drive several times, then disassemble it, saw the platters into several pieces, and discard the pieces one every month over a large geographic area so they’re not all in the same landfill. I am a 2 on that paranoia scale. I use a run-from-cd version of linux to erase the data. This leaves the drive more empty than when it was shipped from the factory, but the manufacturer’s low-level drive info (like the serial number) is still there and the drive is formattable and usable. Theoretically, data could be recovered from the drive using hi-tech sophisticated forensics, but not by the average computer user or even a tech-geek like me, and the folks who could do it wouldn’t waste their time recovering my data. The way Leo writes it, “DBAN will automatically and completely delete the contents of any hard disk that it detects.”, once you boot from your DBAN CD, it will erase every hard drive on your system! Let’s hope he doesn’t mean this, and that DBAN asks you which drive to erase. Meantime, though, I would not yet dare to try DBAN. As a constructive further comment, if you have replaced (say) a flakey C-drive, and want to erase it after replacing it with a new one, put the old drive in a USB enclosure (e.g. NexStar-CX, about $50) and (assuming DBAN lets you select the drive) erase it in there. I was actually quoting the DBAN web site. There is, in fact, an option to do exactly that: automatically erase everything it finds. Why not use Secure Erase instead? It’s built into almost every contemporary ATA drive and thus, significantly faster as well, since it’s the drive doing the work, not the CPU. I want to donate my old computer,I used Gutton eraser and it ran for 48 hours. I was told that it also erased the windows vista ,and it wouldn’t be any good.And i don’t have the windows cd.would that be true.I thought you could use a pc monitor with any cpu My knowledge of computer is limited,so not sure if the man was telling me the truth. AFAIK, on most big brand computers, Vista and later has a “run once” program to backup Windows (of the the new computer) to 2 or 3 DVDs. Normally, at any time, you can restore Windows from a “recovery partition”. If you wiped the whole drive, you wiped the recovery partition too. Certainly seems likely that the eraser program deleted everything off the disk, including the operating system. It’s unfortunate that you do not have the re-installation media. The computer is still good though. It’s just that the new owner will have to get an operating system going on it, and find any necessary drivers. One thing that many people do is install a non-microsoft operating system in a case like this. Ubuntu is a good choice. So go ahead and give away the computer, and refer them to this article on Ask Leo! 7 years ago after buying a new HP notebook the drive died after just 6 months. The people at HP talked me through trouble shooting the drive and decided it had died, and sent me a new drive, free. I only needed to return the dead drive. Not being able to format the drive, I took a strong magnet and sat it on the drive for several hours. I don’t know if this worked, but it was the best solution I could come up with. That magnet probably did nothing, but if you haven’t had any problems 7 years later you’re probably OK. HP probably immediately destroyed the drive pretty quickly anyway. It’s unlikely they would go to the expense of trying to recover the data as it would have no value to them. Sometimes, unfortunately, we’re forced to trust the people who fix our computers. Our data is exposed whenever we bring our computer to a tech for repairs. If you have sensitive data you might want to think about using Truecrypt. Otherwise, after the fact, as Leo said, drilling through the drive may be our best alternative. old CRTs? I am looking for a quick fix obviously, but this may determine whether I donate or recycle. Thanks! To the best of my knowledge degausing coils (and large magnets) do not have sufficient power to erase today’s hard disks. 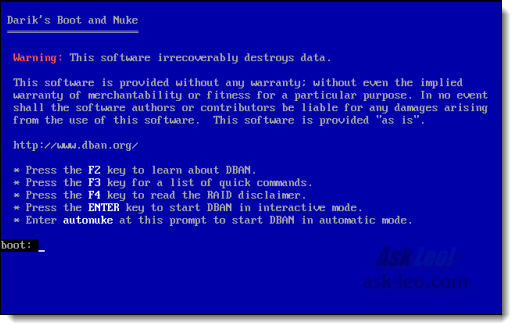 Reformat or use a tool like DBaN to erase the hard drive before donating. I’m looking to sell an alienware computer, which has the hard drive formatted for RAID (I’m still not entirely sure what this means). Anyway, I tried to use Dban and RAID hard drives aren’t supported. I’ve already used my alienware respawn disks just to get the ball rolling. How can I completely erase all my personal information and get by this unsupported Dban problem? It’s probably too late now but you need to open the BIOS and change the SATA mode to IDE then erase each disk. You can then change it back to RAID in the BIOS to reinstall using recovery disk or system image but you may need to recreate the RAID. What about for a Mac? Any ideas? Can anyone help me urgently? I had some sensitive data in pendrive, that i have overwritten now but i am scared by the recovery tools that pretend to recover even overwritten data. So should i also use Dban?? I am giving pendrive to someone, please help me. If i only want to use Dban for USB flash drive, not for hard disk, would it work?? Please answere my few questions , i want to wipe pendrive permanently so that nothing can be recovered. Dban isn’t for wiping a pen drive. Dban nukes all of the drives attached to your computer, so it would also wipe out your hard drive. A good program for wiping an external drive such as a pen drive is CCleaner. On CCleaner’s tool menu there is a function to wipe an entire drive. And finally, for most people a standard secure wipe will do. Unless someone is taking forensic tools to your data it’s rarely an issue as long as you just format or wipe the drive, even once. Nothing said about cost, if you have to be licened to do , or if it’s a subscription deal . I need to return a faulty laptop for refund in next few days. It is only 3 mths old and recently had motherboard replaced. The only sensitive data would be some passwords. Should I wipe the HD? If I do, will I be liable for any charges if I leave no OS. I do not have any disks so wouldnt be able to reinstall windows and not sure I would know how. Depends on the sensitivity of those passwords. If it were me, I’d wipe it. Why the article says it’s “Posted: December 9, 2011” but yet there are comments from 2004? My name is Victor, 45 y/o, Portuguese. Don’t know if you have anything published about flash drives security. I would like to know your opinion (if you have one) on this. I work with very sensitive info and I’m always afraid that if I lose any of my pen drives, falls in competition hands and they find my password… I’m (sort to speak) doomed…. I’m thinking to purchase the “Ironkey D80” that seems to be… if the access fails it automatically overwrite the full existing content. The reason of my contact is because I’m not too sure that this will be so effective as they say and would like to know if you have any option about this or can recommend better solution. I apologize if you already have a thread posted about this, if this is the case I’ll be happy to receive the link. Thank you for lhe indo. I’ll check both links. And make sure you have the contents backed up. I would assuming that losing your only copy would be just as disastrous. Flash drives often fail. At least I’ll try to difficult that task in case it happens. Thank you. That content is erased and replaced with another. Not sure what you’re looking for – the question is very vague. I took the hard drive out of my HP laptop computer. I want to do this because before I donate the laptop. Will some get it and put in a hard drive and see my files? The computer crashed so I cannot delete anything at this time. Your files are on the hard drive, so there is no way anyone can access them if the hard drive is gone. However, do keep in mind that if you give the computer away without a hard drive or operating system it is not much use to the person you are giving it to. They might not want it then. So you should explore a few different options before moving forward. Hello ok I didn’t see this question I apologize if it was there. I need to deep clean my lenovo y430 laptop it came with vista installed is there anyway I can do this and keep vista on there? I am not giving it away or getting rid of it so it doesn’t have to be wiped yet but alot of programs on it and its slower than molasses. It depends on what you mean by “deep clean”. You can try a repair reinstall, but a true deep clean means a real reinstall which would wipe everything and you’d need to reinstall all your programs. Honestly, that’s when I just get out the drill and start drilling holes in the drive. Much cheaper, and often quite therapeutic. Aside from the hard drive, are there any other laptop components that hold sensitive data and should be erased before donating? If you wipe your internal drives (both hard and SSD), you’ll be safe. DBAN will automatically find and wipe all internal and attached drives on your computer. How many holes do you drill? Which area/position of the disk do you drill? There are probably no specifics available on that. Probably as many as you can. Hi Leo. What are your thoughts on CCleaner’s “Drive Wiper” feature? I typically delete the files that I know to be personal then use the “Free Space Only” option. If completely overwriting a drive I use the “Entire Drive” option. I like doing it this way so I can wipe drives while being logged into windows. CCleaner’s wipe feature is fine for wiping free space, but it can’t wipe the c: drive. In order to wipe the system drive, you’d need a program like dban which is a standalone bootable wiper as you never know if there is a sensitive file which you forgot to delete. That works, except the a drive wipe can’t completely wipe a system drive that’s in use. For that you need to be able to boot from something like dban. This iPad was given to me by a family member I have pictures and other things on here but I’m still getting my family members messages and info on here how do I delete her without messing up what’s mine on here? You would do well to find a site the specializes on iPads to get your best answer. But mostly you’ll need to log out as her. That means to log out from her Apple account, and also from any apps she has installed. Delete apps you are not using. Then create your own Apple account and log in as you. You’ll want to first make sure that your own pictures are stored locally on the iPad and not in her iCloud account. So it would be good to find iPad specific instructions. Or DBan. Or just encrypting the hard disk and throwing away the key. Encrypting is also a nice option. According to Scott Moulton a hard drive recovery expert, a simple Windows full format of a hard drive is enough to prevent the data being recovered by normal human beings, repeated overwrites or smashing the drive is plain overkill unless you expect the NSA or FBI to be looking at your drive. There is nothing I haven’t tried to erase clean my hard drive. I have a Dell computer with Windows xp version 3.1 no matter what I cannot see what key would allow me to erase everything. I installed the disc but only allowed me to reboot nothing more . Every one on the Internet shoot of their mouth but nothing that I am able to use . Can someone please help me and spoon feed me the information. So the article lays out steps to erase a hard drive. Which ones have you tried, and how do they not work for you? Bit if I still have programs for instance all my email messages from others, doesn’t this mean basically everything is still thère. Honestly, it really depends on exactly what you’re looking at. In some cases, there are ways to revive a faulty drive so it’s best to take the extra steps to wipe it. The drive may be damaged in a way that DBAN won’t work, in which case, you might have to drill a few in the drive.